The roof — any roof — is a big-ticket item on the house so choosing it can be a little unsettling. There are so many colorful options available that it’s easy to get wowed by the prospect of something other than the traditional charcoal. 1) Get large samples of your roof options. Do not choose a roof from a photo on the computer or a little brochure. Make sure you hold the roof sample up against the side of your house to test for color coordination and to see how busy the two are when side-by-side. Stand back at the curb and take a good look. If possible, get the address of a home that has the roof already installed so you can see how the roof looks over a large area. Does it get lighter or darker? Good to know ahead of time. If you follow these two rules, you will narrow your options down to two or three reasonable choices and avoid any major, expensive roof mistakes. Yes, it’s winter and the roof in this photo is covered with snow, but now we can focus on the rest of the house, particularly the stone. What works on this house is the color palette that is taken directly from the numerous available hues in the stonework itself. The bricks are a monochromatic rusty red color that complements the stone without competing with it — a challenge when you have multiple materials on the house. 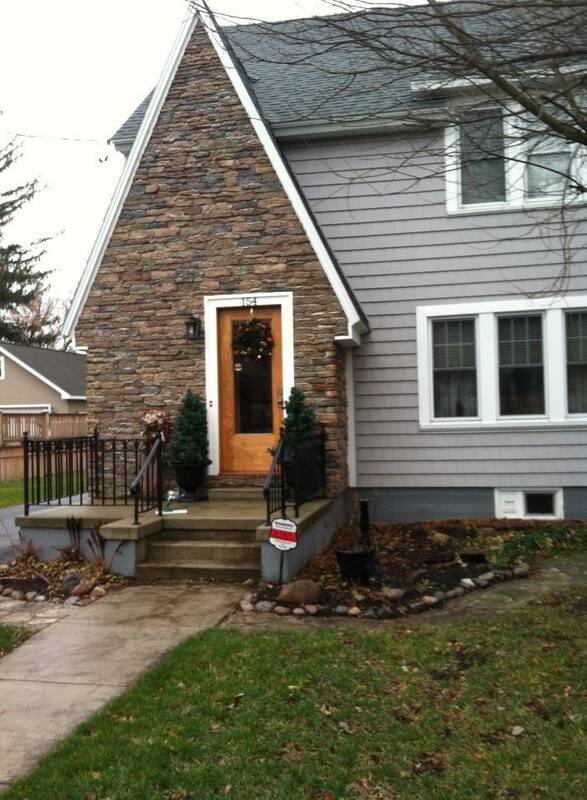 The siding is a gray neutral, also in the stone. The trim is pulled from some of the darker taupe stones. How easy is that? Job done. If you are building a home with different materials, use the busy one with the most colors (stone or brick) to make the rest of your color decisions. That way, the whole house will come together in a harmonious cornucopia of color. The alternative? Choosing a color that is not in the palette at all. The result? A disjointed effect that divides the house into sections and makes it seem smaller. Can be done, but it’s tricky and needs a professional colorist to pull off. Do yourself a favor and stick with the natural palette that presents itself to you from your building materials. In this brick house example, the dark sandy grout color was used as a siding color, and it coordinates beautifully with the earthy shades in the brick. Even the roof is tied in although black would have worked just as well. Contrast that with the pink brick and lemon yellow siding example below right. Yikes. Sometimes there’s just no way around ugly brick except to paint it. And the results can be stunning. Not only have you made your house bigger visually by blending in the brick with the siding color, but also you have added texture to the house without the busy look that highly variegated brickwork can create. A great compromise and an updated house. Sometimes the “bones” of an old house fall under the category of “What were they thinking?” You could say that about this brick fireplace with its random placement of dark bricks and the outdated brass enclosure. But not to worry. Your family room is not doomed to the styles of 1972 — you have options. One of the best ones is to paint the brick as shown in the after photo (from Southern Living Magazine’s Makeovers). 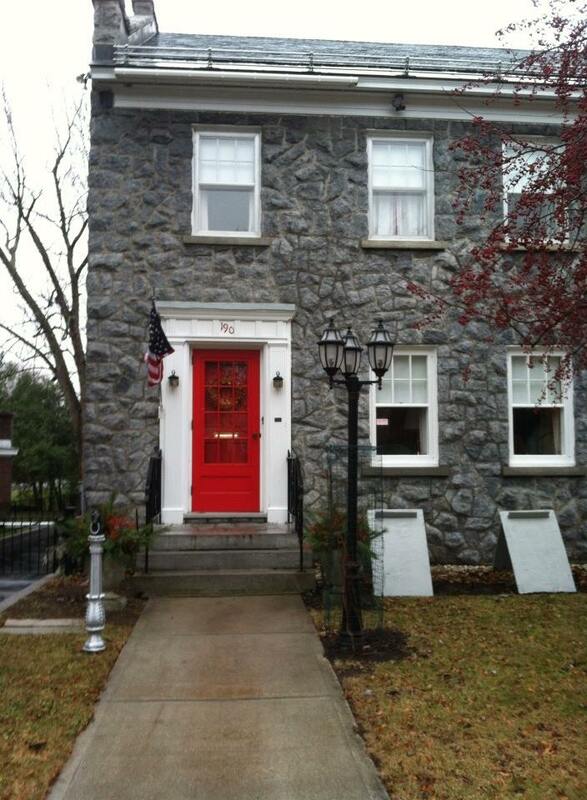 The homeowners covered the offensive brick with a flat, textured paint in the green wall color. They painted the hearth in a natural stone color. Then they added two bookshelves for a built-in look and painted them the same green. The new fireplace insert in a bronze color blends nicely. A narrower mantel and corbels painted cream pop off the green — art finishes the focal point. The overall result is a fireplace wall with emphasis on everything but the original dated fireplace. When faced with old brick or other outdated hardscape in your home, consider painting it for an almost instant update without the expense of covering it or replacing it. This makeover was a huge success. No more ugly brick. 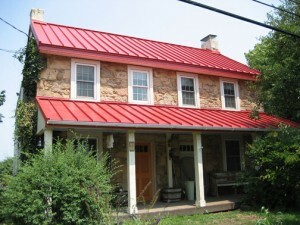 Just a pet peeve of mine, but I really do not care for a bright red metal roof on an old historic stone house. I know that some of my bias is regional–I’m sorry if I’ve offended anybody’s taste. But what I much prefer is a color that comes from the stone itself. What that does is blend the roof with the house and not call it out like a big old stop sign on a dirt road. 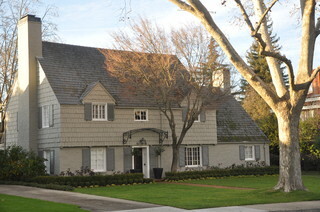 This photo shows a neutral option for a metal roof color. Perfect actually for the little stone house above. If you are choosing a metal roof color for your home and you do NOT want to feature the roof as the focal point of the neighborhood, choose a color that blends or approximates a traditional roof color (grays, bronze, brown, charcoal, black). On the other hand, if you need people to find your house in a snowstorm, then choose a bright Crayola color and love it. Fair warning. You are currently browsing the Brick House category at Your Home & Color Coach.